It would be a great reference to have a list with the various badge manufacturers of Canadian badges. The list should include the makers name, (or names), the period of time making badges (if known), badges made (as known), plus??? The CEF had badges made by many manufacturers and suppliers. The names of the makers can be found on the back of some badges, but unfortunately not every badge was marked. Some brief comments on the manufacture of badges. The vast majority of badges were usually made by die striking, while some badges were made by casting. The metals used varied. Many CEF badges were made of copper with a wide range of finishes. (blackened, pickled, etc.) Other metals encountered are brass, white metal, bronze, and silver (usually associated with officer's badges). Gilted or gold washes, "frosting" (silver or gold) and "fire gilt" are finishes also found. A few badges have enamel inserts added. Fasteners are another area of interest and important to help establish authenticity. These include lugs (loops fastened to the badge with a type of wire pin passing through the holes), both round and flat styles, tang back (pointed metal blades that fold over), pin backs, screw posts (threaded posts with a nut), and sliders (a metal blade on the vertical used to slide into a pocket or slit in the headdress). Others may have some other varieties to add. Some makers have a definite regional association, while others appear to have supplied badges to all and sundry. Below is a list of known makers. The name on the badge may not exactly match the style of the name in the list. Additional variations of the maker names are not always found on badges by that maker. Please note the date of the latest edit at the bottom of the post. The list is arranged alphabetically, using the makers last name. Samples of maker marks courtesy of Larry Wills are attached as thumbnails. Identified as C/x collar number maker. There are more to be added to this list. In addition, many officers had badges made by jewellers, who added their maker name on the badges. Information is based upon the Charlton Standard Catalogue of First World War Canadian Infantry Badges, W.K. Cross , input from other collectors, and from dealers. See Also the King's Crown Maker Mark LIST further in the string. Last edited by Bill A; 01-01-14 at 05:38 PM. Reason: Additional makers added. Maker moved on list. Added sub-section for C/x numbers. Excellent list Bill, certainly a lot of work went into this. I see you have Roden Brothers noted under button manufacturers, however they also made badges. I have a WWI General List badge made by them. I missed that one Cliff. Thanks. Roden made several badges I believe. They sure made a lot of the general list badges. PMP is Pressed Metal Products Ltd. of Vancouver. They are still in business making all sorts of badges and medals, including the Commanders Cross of the Order of Canada! Thanks John. I will add the note to the original list. I am not sure that there were not two makers by the name of Allan/Allen? For now I will use the Allan with a note that there maybe another with the different spelling. David, the initial list I posted was a CEF list. I am going to start a second list for 1920-1953 period badges, and a third list for 1953-current badges. I will do that in separate postings so they will be focused on that era. David, did the Mackenzie Clay company make CEF badges? And, the same question for PMP? Greg notes that they are still working today. Greg, do they make badges for the CF? This posting will be a list of the badge makers of Canadian badges, focusing on the 1920-1952 or king's crown period. Little research has been done in this area, and this list is under construction. Unlike WW1, there were far fewer makers of Canadian badges in WW2. Note: List is alphabetical based upon the makers last name. Please note the date of the latest edit at the bottom of this post. Birks (Montreal) (Badges made by Birks include Canadian Provost Corps, Algonquin Regiment, South Saskatchewan Regiment, Lorne Scots (cap & collars 1940), Sault Ste Marie and Sudbury Regiment (1938), Royal Canadian Dragoons, Royal Canadian Engineers (1945 run). Note: In an email from Will Scully of the same firm, he indicated that during WW2 the firm used whatever punch or die was available for badge marking. Thus any style may be found on the badges. After the war the contracts went to the lowest bidder, and the maker mark was usually dropped as a cost cutting measure. Current contracts require that the date be added to the run. For collectors, modern Canadian Forces cap badges will now have a maker mark and date stamp on the slider or badge. Early CF examples are found without maker names or dates. Stephenson Osher Coy (Montreal) (Sault Ste Marie & Sudbury Regiment and Algonquin Regiment, Corps of Military Staff Clerks, cap and collars Prince Albert Volunteers 1942). Last edited by Bill A; 04-11-14 at 08:42 PM. Reason: Additional makers and details added. Perhaps a Pre-1914 list is in order as well? I have a couple that come to mind for that period. 1. MacDougall - London made some CEF badges. I know of both 42nd Bn and 85th Bn Officers' patterns made by them. 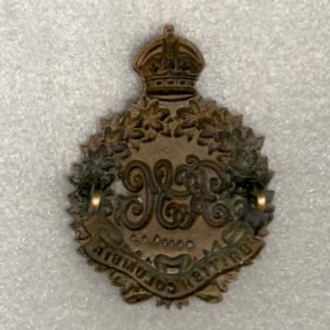 See also my post on my 5th RHC officers glengarry badge. 1. PMP should be in this section I think. I don't know them to have made any CEF items. 2. Roden Also produced KC-period badges. I know there are more...will post more as I remember. Will look over some buttons and add to that list as well. Trying to find an answer as to whether MC manufactured CEF badges, I was looking through some old auction catalogues. - RCD officers, tangs, "J & Co."
- 57th Battery Quebec veteran's pins, "Trophy Craft" and "Seifert"
- 11th Bttn Saskatchewan, "Reich Folkestone"
- 136th Bttn Durham County, "Reynolds/Port Hope"
- a variation? 229th Bttn Moose Jaw, "Lees & Creighton"
As for Roden, "Canada" titles marked "Roden 1916", so they can get moved out of your 'buttons' list I guess. David, The RCD badge, what time period is that one? And Trophy Craft and Seifert were makers of veterans' pins only? Last edited by Bill A; 18-02-08 at 01:05 PM. Makers are listed alphabetically by their last name. Last edited by Bill A; 10-03-08 at 08:21 PM. Reason: Additional maker(s) added. 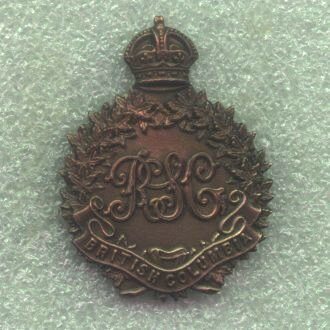 The catalogue description for the "J & Co." RCD badge reads, "Officer's, bronze, WW1 issue. Heavy well made, Royal Canadian Dragoons, one of three folding lugs remaining, Maker Marked J & CO on the smooth back... These badges in Bronze where (sic) WW1 issue, as this badge usually in brass." As for the vet pins, the lot description reads like both battery pins are either vet pins or sweetheart pins: "both small colored enamel pins, screw posts...". These are both from Marway's #112 sale, and that catalogue is still online. There is a pic of the RCD badge, which is quite different from the usual 'balled' horn -- very antelope-ish antelope, with lots of detailing and scribed horns. Thank-you David, ammendment to the list has been made. Now, an important question. Do we include sweetheart pin makers in the badge makers list? (Some are one and the same.) Or, are we into another list? Perhaps a string could be started on the Sweetheart Vets sub-board? My preference for now is to stick to badge makers.